The human retina is the tissue lining the back of the eye (figure 1). Like a camera, the retina “takes the picture” that gives us our vision. A jelly substance fills the inside of the eye. This jelly substance is firm at a young age and begins to liquefy later in life, causing floaters. When the jelly liquefies too quickly, it can pull on the back of the eye and tear the retina. If a retina tear occurs, fluid inside the eye can leak under the retina through the tear. 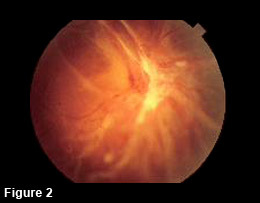 If this occurs, the retina separates from the back of the eye causing a retinal detachment (figure 2). Surgery is needed to re-attach the retina. Retinal detachment surgery usually involves removing the jelly and placing a gas bubble inside the eye to “re-attach” the retina to the eye wall. Laser is then usually applied to create a bond with the retina and the eye wall, creating a seal to keep the retina attached. After surgery, usually within the first few months, scar tissue can grow over the retina. 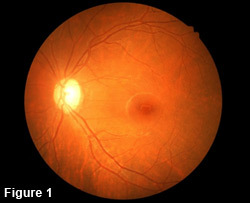 This process is known as proliferative vitreoretinopathy (PVR). This scar tissue can cause the retina to tighten and re-detach. More extensive surgery is needed in these cases. There is currently no known treatment to prevent PVR from occurring. Fortunately, PVR occurs in less than 9% of all retinal detachments. Also, worsening of cataracts is usually expected after retinal detachment surgery. Cataract surgery is often needed after the retina has stabilized. Therefore, post-operative follow up is essential.